Hundreds of devotees thronged different pandals as Durga Puja on Mahasaptami day on Thursday and worshipped Kalratri form of Goddess Durga. Attired in colourful dresses, young boys and girls, elders with their grandsons and mothers with their babies gathered at pandals to get “darshan” and “ashirvad” of Goddess Durga in the evening. Religious songs reverberated in the air as Patnaites came on roads to have glimpse of different pandals, which have been tastefully designed and decorated by artists from Patna and West Bengal. 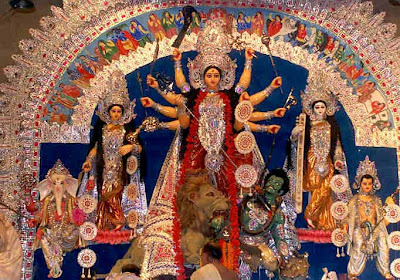 Different puja samitis are vying with each other in giving their respective pandals a better look so that they attract maximum number of the devotees. They have chosen different replicas of famous temples of the country and electric displays portraying important events like return of Sunita Wililiams from space, Mahendra Singh Dhoni holding Twenty20 World Cup. Even international films and events have caught the imagination of the organisers. Harry Potter, Micky Mouse and Donald Duck were appreciated by one and all. Small stalls offering various dishes and delicacies have come up at every nook and corner in the city, catering to the needs of all ages. While traditional families stuck at the stalls of golgappa, bhelpuri, chats and other items, the modern ones hovered around stalls selling junk foods.